In the 1997–98 football season, Newcastle United played in the FA Premier League. They finished 13th and reached the FA Cup final, losing to Arsenal. During the summer, David Ginola and Les Ferdinand were sold to Tottenham Hotspur, while in a pre-season friendly match, Alan Shearer sustained a horrific ankle injury which would keep him out for half the season. Manager Kenny Dalglish signed goalkeeper Shay Given, midfielder Temur Ketsbaia, striker John Barnes and veteran striker Ian Rush, the club's eldest player signing at age 36. The highlight of the 1997–98 season was to be the club's run in the UEFA Champions League, seeing them defeat Barcelona 3–2 after a hat-trick from striker Faustino Asprilla. The club's Premier League form, however, began to suffer following Asprilla's departure from the club in January, and despite the return of Shearer to the starting line-up, he was unable to recapture the form he had found under Kevin Keegan. The club reached the FA Cup final only to fall to a 2–0 defeat by Arsenal. Controversy surrounded the club in March 1998 when two board members, Douglas Hall (son of chairman Sir John Hall) and Freddie Shepherd, were filmed in a Spanish brothel making a series of remarks to an undercover tabloid journalist. They ridiculed Shearer, boasted of "ripping off" supporters with the club shirts they sold, and called the women of Newcastle "dogs". Almost unbelievably, Shepherd subsequently became chairman the following season. Wikimedia Commons has media related to FA Cup Final 1998. Newcastle enjoyed a good run in the 1997–98 FA Cup and reached the final for the first time in 24 years. They never looked like winners, and the final whistle blew with a 2–0 scoreline giving the trophy to opponents Arsenal. But as Arsenal had completed the double, Newcastle entered the 1998–99 Cup Winners' Cup. Dalglish's cautious brand of football proved unpopular with supporters used to Newcastle's previous swashbuckling style; more importantly this cautious style was not producing results. Many players signed by Dalglish were not considered to match the quality of those who had left the club this season. The team's 13th-place finish gave particular cause for concern, as Newcastle had finished runners-up in the last two seasons and had never finished below sixth since returning to the top flight in 1993. To add insult to injury, only 35 league goals were scored by the club all season. 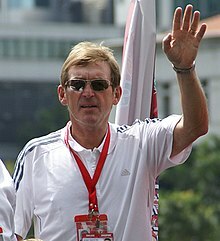 Despite signing Dietmar Hamann, Nolberto Solano and Gary Speed, several unsuccessful transfer deals along with a poor start to the 1998–99 season led to Dalglish being sacked. The following players did not appear for the first-team this season. ^ "Football: Shearer out 'for months' as pounds 6m Ferdinand joins Spurs". The Independent. London. 28 July 1997. ^ "Toon Army dreams of absent friend as thrills turn to chills". The Independent. 10 January 1998. ^ Toonpedia: Newcastle United 3–2 Barcelona 17 September 1997. Black and White Toon. Retrieved 14 August 2013. ^ "Shearer the Geordie gem". BBC News. British Broadcasting Corporation. 15 June 2001. ^ "Newcastle Utd directors resign". BBC News. British Broadcasting Corporation. 24 March 1998. ^ "A Sad Episode for Newcastle". New York Times. 25 March 1998. ^ "Dahl joins Toon for Pete's sake". Daily Mirror. The Free Library. 18 July 1997. Retrieved 2 February 2012. ^ Irwin, Mark (19 July 1997). "Pounds 1m; a year Pearce joins Kenny; Top-flight says Stu". Daily Mirror. The Free Library. Retrieved 2 February 2012. ^ "Clark: Glad to be Wear". Daily Mirror. 28 August 1997. Retrieved 2 February 2012. ^ Millar, Steve (4 September 1997). "Elliott: I'll bounce back". Daily Mirror. Retrieved 2 February 2012. ^ "Ginola bit part as Spurs draw blank". Daily Mirror. 19 July 1997. Retrieved 2 February 2012. ^ "Newcastle United 1997–98 Results (Soccerbase)". Soccerbase. 22 November 2011. Retrieved 22 November 2011. ^ "Newcastle United 1997–98 Results (NUFC.com)". NUFC.com. 22 November 2011. Retrieved 22 November 2011. ^ "Newcastle United 1997–98 Results (toon1892.com)". Toon1892.com. 22 November 2011. Retrieved 22 November 2011. ^ Andrews, Phil (28 July 1997). "Dalglish's striking problem". The Independent. Retrieved 2 February 2012.